Futura Greens creeping bentgrass blend is a superior blend of creeping bentgrass varieties selected to compliment each other for high performance, no matter what your environment. Futura Greens combines three bentgrass varieties -MacKenzie, Kingpin and Ninety-Six Two to provide broad genetic diversity, great turf quality and excellent adaptability. Planting a blend of advanced bentgrasses will significantly improve the quality of any turf stand, whether on a new project or renovating an existing course. 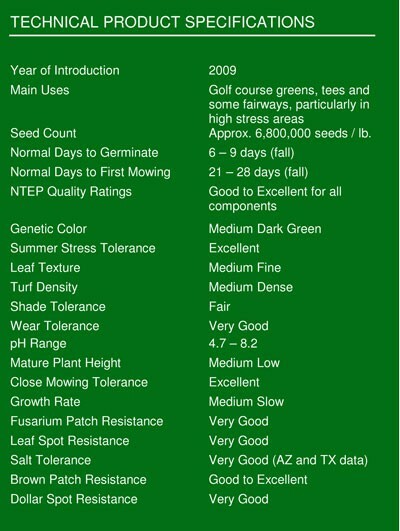 Futura Greens combines three excellent bentgrasses to create a turf with a broad genetic base. This broad base will provide a putting surface with increased resistance to Brown Patch, Dollar Spot, Pink Snow Mold, Pythium and most environmental stresses. Research studies have show that blends often perform better than the individual cultivars alone. Traditionally, turf professionals have used blends of different varieties when planting high caliber projects to ensure a broad genetic base that capitalizes on the strengths of the different varieties. This enables the professional turf manager to attain the highest quality under varying maintenance conditions and environmental stresses. However, a blend of just any two or three bentgrasses won’t necessarily work. The varieties selected must complement each other’s strengths and weaknesses. MacKenzie was developed in cooperation with Rutgers University for superior disease resistance, ultra-fine texture and excellent heat tolerance. Kingpin was developed by Rutgers University as well, for improved Dollar Spot resistance, but with a very different genetic background. Both of these varieties also show early spring green-up, excellent winter active growth, and low Poa annua invasion. Ninety-Six Two was selected for extensive rooting as well as heat tolerance at Texas A&M University. This combination of cold and heat tolerance makes Futura Greens an excellent choice for all areas of the world where bentgrass is grown.